Not much knitting gets done during the summer. And what does get done is usually in cotton. This year I am not even doing that, at least not yet, although I think some dishcloths are calling to me. 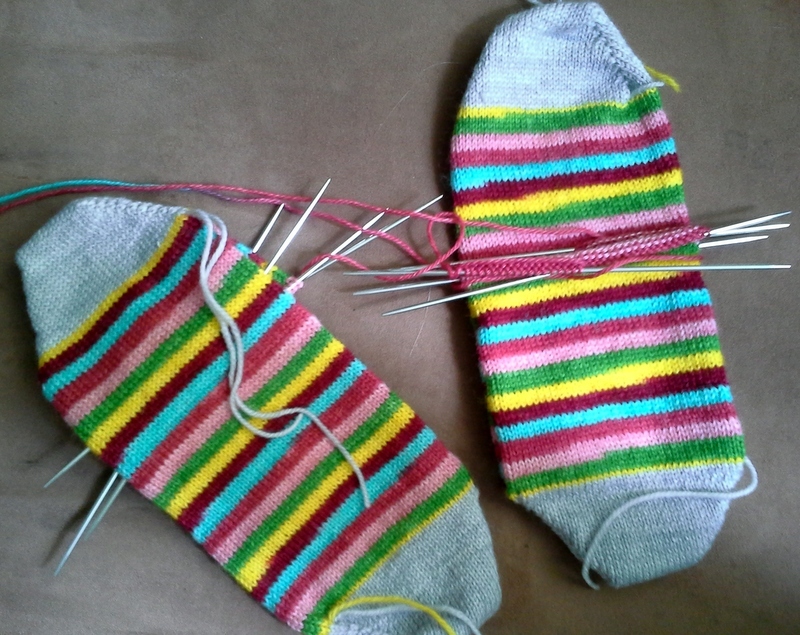 I am knitting a bit here and there, on these socks. With the garden and yard needing so much attention, though, the bit of knitting has been very little. I keep thinking, Once the yard is under control... (as if that will ever happen). In an attempt to motivate myself to pursue dyeing more seriously, I purchased some blank yarn (Lamb's Pride and Cascade 220), as well as alum and iron for mordants (from Dharma Trading Co.) So far, it hasn't worked. There is just so much *other* time critical stuff to tend to right now. Someday, though. The good news is, I didn't warp the loom backwards on this weaving project. The bad news is, I tied the warp threads to the rollers instead of the warp sticks, so there was a lot of wasted yarn and the project was shorter than I planned. This bath rug is almost the widest thing I could weave on my loom, and I had to learn to "bubble" the weft more, to prevent draw in. The last project was feltable wool, while this one is cotton, which has no give or elasticity. Loom: Ashford Rigid Heddle 24"
I'm still missing the warp here and there, thanks to inconsistent tension. When I saw all the rows where the colors ended abruptly midway across, I was puzzled, until I remembered using the 'America' colorway, which is a mixture of red, white, navy, and pink. I didn't like how the navy and white looked together on the loom, but after a trip through the washing machine (on gentle - I was afraid the rug would fall apart!) and dryer (for a little while, then hung to finish drying), the two colors played nicely together. I think I have never been so happy to be done with a knitting project as I am with this one. Doll clothes are too fiddly, almost as bad as baby bootees. By far the worst part, though, was all the freaking eyelash yarn. Fun Fur is not fun at all. I had some trouble with the instructions and left a note on Ravelry for the designer, but there was no response. I closed the mitts and paws with kitchener stitch, used kfb for increases, and performed "jogless jogs" when changing colors. Also, I could not imagine sewing snaps into Fun Fur, much less see my g'daughter getting them to work. The torso was a bit snug anyway, so I added bands for buttons and button holes, picking up about 30 stitches per side and sewing on 6 buttons. My g'daughter wants the matching bonnet, mitts, and tail, but I told her I needed a break from Fun Fur. There is another pattern in Enchanted Knits for Dolls she also wants, but I also need a break from doll costumes. A L-O-N-G break.